All orders must be submitted to Miriam Esther Wilhelm at least three days prior to pick up. Orders can be emailed to me@kjds.org. All orders must be paid for in full before pick up. Our home is open to all, and we we encourage you to join us for Shabbat meals during your visit to the Smokey Mountains. Your generous support will enable us to keep our home open and assist many more visitors in the future. 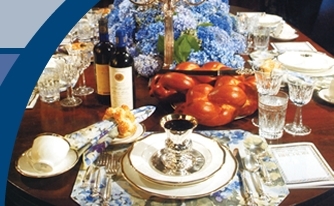 To make a reservation for Friday Night Dinner, please make a payment of $50 per person, Shabbat Lunch $35 per person & Shalosh Seudot is $30 per person. Children 12 & under are $20. Thank you. Chabad of Knoxville is not funded by Chabad headquarters in New York. We, as every Chabad center, are responsible for all funds of our operating budget. We are supported exclusively by the generous contributions of individuals and foundations that care about our community. All funds raised by Chabad of Knoxville remain in Knoxville and go directly into programs and services for the Knoxville Jewish community and Smokey Mountains visitors.